The new Subaru Crosstrek accounts for over a third of UK’s Subaru sales. See why the small crossover is hot in Europe. When Subaru launched the all-new 2018 Crosstrek (XV in global markets) they didn’t know it would take Europe by storm. The all-new 2018 Crosstrek (XV) accounted for over a third of UK’s Subaru sales overall in the first quarter of 2018. It beat all its stablemates, Forester, Outback, Impreza, Levorg, WRX STI and BRZ. In Europe, North America and Australia, the new Crosstrek has propelled the brand to become known as the safety-focused SUV brand. In Europe, Crosstrek garnered success early on, by being awarded Best In Class Safest Small Family Car 2018 by Euro NCAP. The success continued as the all-new XV received a high commendation from WhatCar? In the “Safest Car Of 2018” segment of the annual awards. 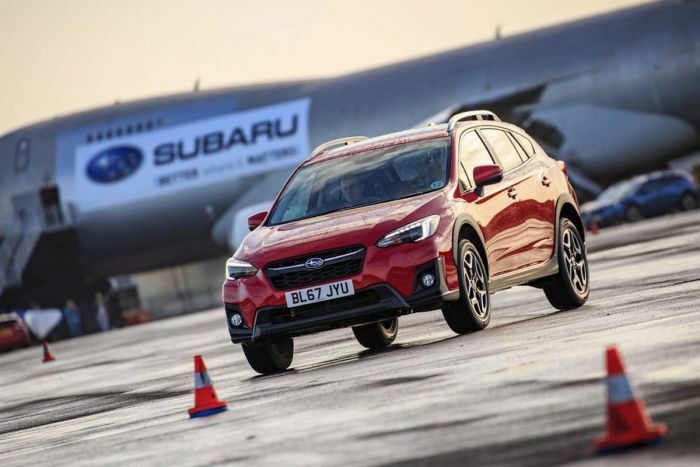 Chris Graham, Managing Director for Subaru UK, commented: “Subaru’s are about safety, reliability, and capability at their core, which is what customer know and expect. We’ve invested a lot of time, effort and resource into showcasing those core elements this year and it’s great to see that our hard work is paying off”. Subaru UK saw a 5.5 percent increase in the first quarter of the year when industry new cars sales were down 12.2 percent in Europe. It was all because of Crosstrek selling beyond expectations. It’s not just the UK where the small crossover is hot. In Australia, the new-generation XV continued its success with sales of 1,416 units, up 88.3 percent for the month and 90.2 percent YTD, maintaining its popularity with buyers in the Sports Utility Vehicle segment. At the 2018 Subaru Crosstrek reveal in Geneva, Subaru Boss Yasuyuki Yoshinaga talked about safety as a core value for the brand. Subaru is focused on safety with their new all-wheel-drive Crosstrek. Safety is a core value that the Subaru brand values highly along with their unique all-wheel-drive vehicles being fun-to-drive, they are tough, and last longer. It’s what sets their vehicles apart, and is a big reason why the all-new Crosstrek is helping set global sales records. Yasuyuki Yoshinaga, outgoing President and CEO of Subaru Corporation, says safety is Subaru’s most important core value. The Subaru EyeSight driver assist system is at the core of their safety technologies. Along with their unique Symmetrical all-wheel-drive system, EyeSight is another big advancement in technology for the brand. They developed the first EyeSight system in 1999, and in 2008 it was the first system to use stereo camera technology to detect vehicles, pedestrians, and cyclists. The Subaru boss says in Europe, 94 percent of Outback owners with EyeSight, said they felt safer when driving, and 25 percent reported the system avoided at least one accident. This was before the all-new 2018 Subaru Crosstrek arrived across the pond. Now the small all-wheel-drive crossover propels the Japanese automaker to become the global safety-focused SUV brand.